A Hypotrochoid (red) and its evolute (black). 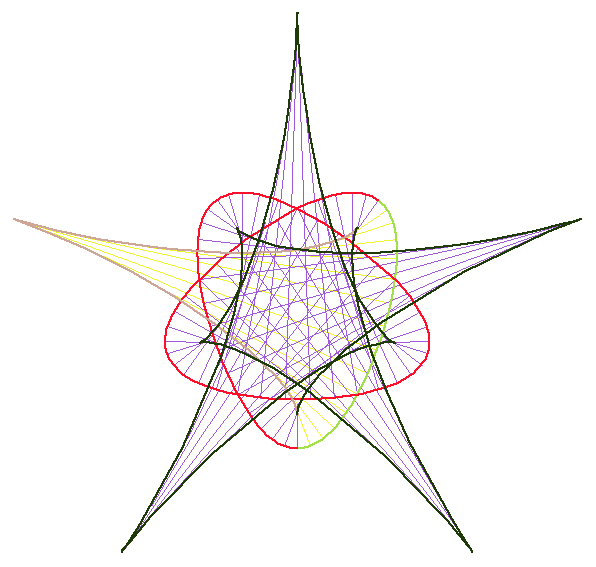 Note that vertexes of a curve corresponds to its evolute cusps. 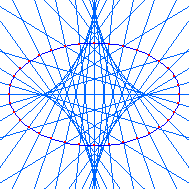 The lines are radiuses of tangent circles. graphics code. Mathematica Notebook for This Page. Studied by Huygens in 1673. Evolute is a method of deriving a new curve based on a given curve. 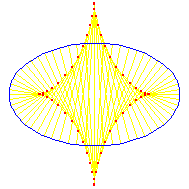 It is the locus of the centers of tangent circles of the given curve. 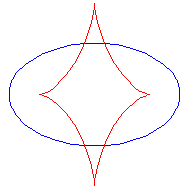 Evolute of a curve can also be defined as the envelope of its normal. Theorem: The locus of Cusps of a curve C's parallel curves is the evolute of C. This is a alternative definition of evolute. See the Parallel page. If curve A is the involute of curve B, then curve B is the evolute of curve A. The converse is true locally, that is: If curve B is the evolute of curve A, then any part of curve A is the involute of some parts of B.
Robert Yates: Curves and Their Properties.